Mummy-Tips: Annabel's Kitchen Daily on CITV! Annabel's Kitchen Daily on CITV! During the February half term break I travelled to Ireland with my girls so that they could film a couple of episodes of Annabel Karmel's new TV show. It was a great experience for them, they worked really hard and had lots of fun with the new friends that they made. Here they are on set doing their first read through. Annabel's Kitchen is a refreshing new kids cookery show that takes you and your children on a culinary journey of exploration and delight. 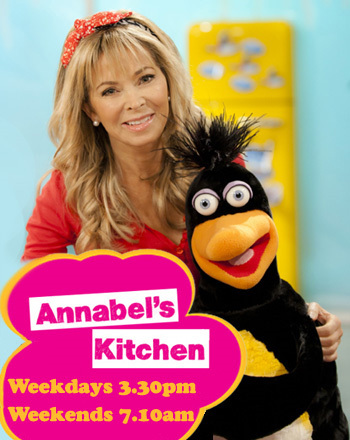 Annabel is joined by comic puppet penguins Jimmy and Pearl and a host of children who come to help her cook. There are 30 shows in the run and I'll be sure to shout when I know when my girls are on but until then set your Sky +, sit back and enjoy the eleven minute show at 3.30pm from Monday to Friday on CITV and weekends at 7.10am on ITV1. A very big 'thank you' to Annabel for inviting us to the pre screening event last weekend. We all had a great time and we'll be vlogging our attempt at creating her Watermelon Pig as soon as we can get our hands on the ingredients.